Picked up these beauties at the Baltimore farmer’s market over the weekend, attracted largely by their names. 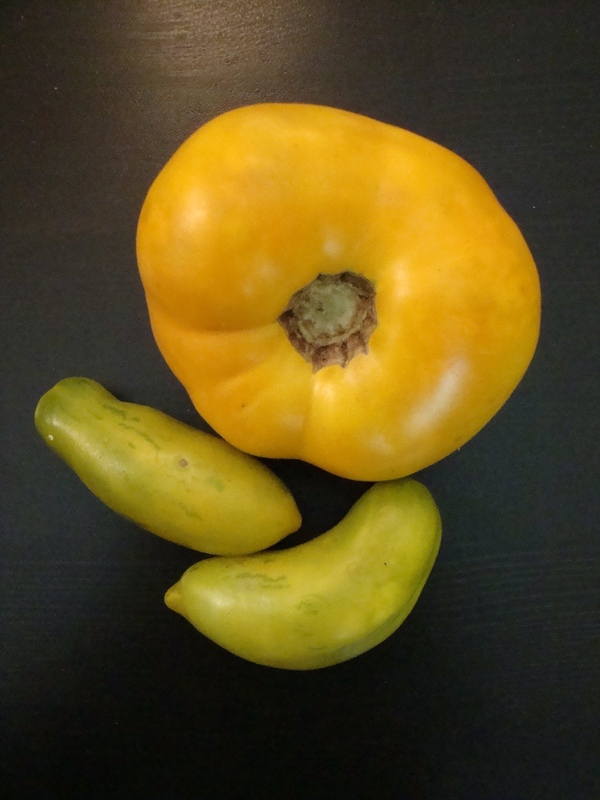 The big yellow guy is a Nebraska Wedding tomato, an homage to (one of) Kate’s home states. Only intended to taste a slice when we got back home, but ended up eating the whole thing in one sitting, standing over the cutting board with, as one witness contends, a look of pure bliss. A wondrously rich and sweet tasting Wedding tomato indeed, particularly sprinkled with a bit of the black lava salt one of the Three Points cooks procured on a recent expedition to Maui. Evidently, this heirloom really did play a part in wedding celebrations, with seeds given to a new couple as a start for their farm. Not so much love for the other little guys, which the farm stand was calling chile tomatoes. Cute, but without taste, a statement that could apply to many varieties of fruit, vegetable, and human. I love homages to my people, she says with a Locust Valley lockjaw accent!